Homeowners in Terezin discover Jewish objects from World War II hidden in their closet. 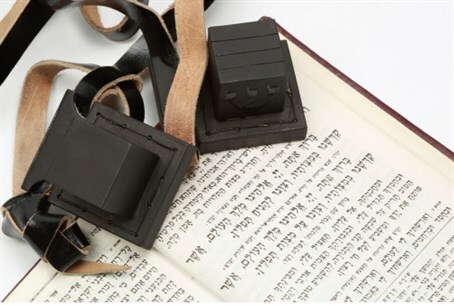 Items include shofars, tefillin, and photos. House owners replacing a roof truss in the Czech town of Terezin in November discovered Jewish objects and possessions buried in the attic beams, the Ghetto Theresienstadt heritage project revealed Thursday. Terezin was the site of a Nazi concentration camp during World War II. Tens of thousands of Jews died there. Among the items found were shoes, photos, teffilin (phylacteries), shofars, holy books, and papers. Some objects even had the names of their respective owners inscribed on them. "The unexpected finds such as these suggest that an abundance of precious legacies from the ghetto period are still waiting to be discovered in buildings throughout Terezin," representatives of the Ghetto Theresienstadt Project said in a news release. The Ghetto Theresienstadt Project, which was founded in 2012, is supported by multiple cultural groups in Germany and the Czech Republic. Experts called to the scene expressed great admiration for the storage of the objects in the attic, adding that it is another indication of the techniques used by Jews in ghettos and concentration camps during the Holocaust to maintain Jewish heritage and art. The heritage group stated that the home owners who found the precious objects wish to remain anonymous because of the sensitivity of the issue among Terezin inhabitants. "In their view, the way that the objects were concealed under the beams indicates the great importance that the prisoners gave in hiding their possessions," the group said. Terezin (Theresienstadt) was designed as a fortress and garrison town for the Austrian monarchy at the end of the 18th century. Germany took control of Terezin in 1940, turning it first into a prison. However, its soon became a transit camp for Jews rounded up in Czechoslovakia or those who had been deported from elsewhere in Europe, primarily Germany and Austria. These Jews were held in the camp until they could be sent to other concentration camps father east. Living conditions in Theresienstadt were extremely difficult. The site, which had once been a small town of 7,000 Czechs, contained more than 50,000 Jews. The peak population occurred in 1942 with about 58,000 inmates, who lived with almost no food. Close to 16,000 people died of starvation that year alone. Despite the fact that Theresienstadt was used in similar ways to other transit camps and ghettos - as a station between Jews' homes and the death camps in Poland, Theresienstadt, was named the "example ghetto" after the war, thanks to Nazi propaganda. After 500 Danish Jews were sent to the camp in 1943, the Danish government insisted that the Danish Red Cross as well as the International Red Cross visit the camp. It was the first time a European country insisted on fair treatment of their Jewish citizens. The Nazis agreed to the visit in order to dispel rumors of extermination camps. And weeks of preparation commenced. In order to eliminate severe overcrowding, the Nazis sent many Jews to the death camp Auschwitz. They also set up fake shops and cafes to create the impression of a normal life being led in the Jewish ghetto. Rooms were re-painted and arranged so that it appeared no more than three people were living in one room. The commission visited on June 23, 1944 and apparently formed a positive opinion of the town. Following the successful Red Cross visit, in which Theresienstadt was seen as a model internment camp, the Nazis decided to make a propaganda film there. Shooting began on September 1, 1944 and lasted eleven days. After the film was completed, most of the cast as well as the director were deported to Auschwitz and murdered. Most of the film was destroyed, but some footage remains. Terezin was finally liberated by Soviet troops on May 8, 1945. In Terezin today there is a small Czech community of 2,900 people. A memorial to those murdered exists on site. The camp archives are managed by the Jewish Museum in Prague.